Foreigners are encouraged to monitor the Centres for Disease Control and Prevention (CDC) website by searching for the keyword "China" on the website and the China page of the World Health Organization (WHO) website regarding communicable diseases in the region. Hand-foot-and-mouth disease is a viral illness that can involve the mouth, hands, feet, buttocks and genitalia. It is caused by a group of enteroviruses, the most common organism being from the coxsackie virus subgroup, coxsackie virus A16. Coxsackie virus A5, A7, A9, A10, B2 and B5, as well as enterovirus 71 can also cause the illness. It occurs worldwide, with a peak incidence in the summer and autumn in temperate climates. It is most common among infants and children younger than 10 years. Adults generally develop less severe symptoms than children. It is very infectious so epidemics can occur. Epidemics have occurred in Singapore, China and Taiwan in recent years. These were caused by enterovirus 71. It is not a notifiable illness. Transmission is commonly by the faecal-oral route. Contact with skin lesions and oral secretions (including coughs and sneezes) can also allow transmission. Incubation period is 1 week. An infected individual can continue to shed the virus in the stools for some weeks. Prodrome: includes fever, malaise and loss of appetite. There may be a sore mouth or throat. Enterovirus 71 can cause vomiting. 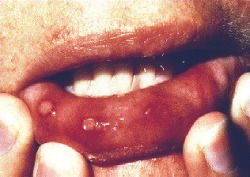 Mouth lesions: after the prodrome, lesions develop in the mouth. These may be on the buccal mucosa, tongue and hard palate. The uvula, gums and lips are sometimes involved. They begin as macular lesions that progress to vesicles which then erode. Mouth lesions are typically yellow ulcers surrounded by red halos. They may be uncomfortable. Children under 5 years tend to have worse symptoms than older children. Skin lesions: 75% also develop skin lesions.1 They are mainly on the palms, soles, and between the fingers and toes. They may itch. They start as erythematous macules but rapidly progress to grey vesicles with an erythematous base. Lesions may also appear on the trunk, thighs, buttocks and/or genitalia. These lesions are mainly an erythematous maculopapular rash rather than the papulovesicular ones found on the hands and feet. The rash lasts about 3 to 6 days. The virus can be cultured and detected from the lesions or stool specimens. It may also be detected serologically. Parents need to be reassured that it is unrelated to foot and mouth disease in animals. If the mouth is uncomfortable, dehydration may result from poor fluid intake. Encourage adequate fluid intake. Admission to hospital is rarely required. Antipyretic analgesics such as paracetamol or ibuprofen are usually all that is required. If the mouth is very painful, an analgesic such as benzydamine may be helpful. Antibiotics are only required if secondary infection of skin lesions occurs. Any cardiovascular or neurological complications need to be treated appropriately (see below). Secondary infection of skin that has been scratched. Painful stomatitis due to oral involvement. This can lead to dehydration. Neurological involvement and meningitis is more likely if enterovirus 71 is the causative organism. Neurological involvement can include encephalitis, encephalomyelitis, polio-like syndrome, cerebellar ataxia, transverse myelitis and Guillain-Barré syndrome. Cardiopulmonary complications include myocarditis, intestinal pneumonitis and pulmonary oedema. If infection occurs during pregnancy there are reports of spontaneous abortion. If infection occurs in the third trimester, there is a chance of neonatal infection. This is generally excellent with a full recovery in most people. Symptoms tend to improve within 3-6 days, usually with full resolution of skin and mouth lesions within 7-10 days. Attention to hand washing in the family should reduce further spread. The virus may be excreted in the faeces for some weeks. As the virus can be excreted for weeks after clinical signs of infection have resolved, exclusion from school is not practical. Parents should keep the child off school/nursery while they are unwell but they can return before all of the lesions have healed.